The ElectriCalc Pro solves electrical calculations in seconds.. The ElectriCalc Pro is the world's most complete Code based calculator. Answers conform to the 2011 NEC® Code. It is also compliant with the 2008, 2002, 1999 and 1996 National Electrical Code. Calculate wire sizes per NEC 310-16 and 310-17 code. Calculates Fuse and Breaker Sizes per NEC 430-52. 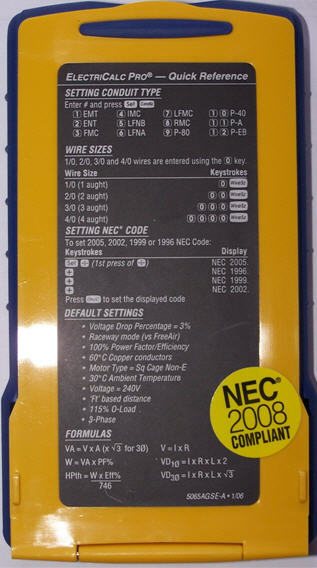 NEC Table number displays when performing wire size calculations. Parallel and derated wire sizing. Automatically finds NEMA starter sizes. Integrated Voltage drop solutions. Find minimum VD wire size, maximum Length for any given wire size, drop percentage, actual number and percentage of Volts dropped. Calculates service and equipment grounding conductor sizes per NEC 250-122 and 250-66. Calculates grounding conductor wire size. Convert from Kilowatt hours to BTU. OHM's law calculations. Enter any two values to solve for the third. Functions as a standard math calculator. Easy to follow User's Guide. Full One Year Limited Manufacturer's warranty. Free Armadillo™ Gear protective hard case. Buy the Electrical Calculator Here for just $89.95. That's 10% off of the $99.95 MSRP. Most orders arriving before 11:00 AM Central Time are processed and shipped the same day. 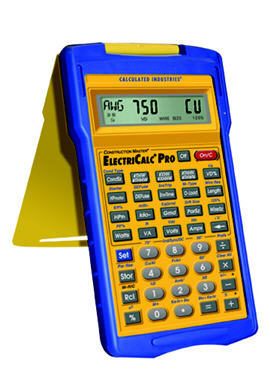 The ElectriCalc Pro Model 5065 is not available in office supply stores like Home Depot or Lowes. 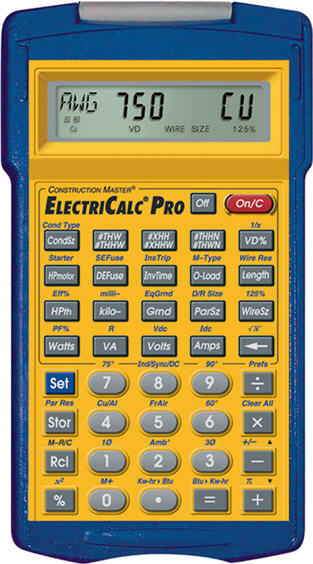 The EletriCalc® Pro is manufactured by Calculated Industries. NEC and National Electrical Code are trademarks of the National Fire Protection Association. The inside of the Armadillo Gear cover is a Calculator Quick Reference Guide.